Our hands age much faster than our face, as it is put through to a lot more work in the course of a day. 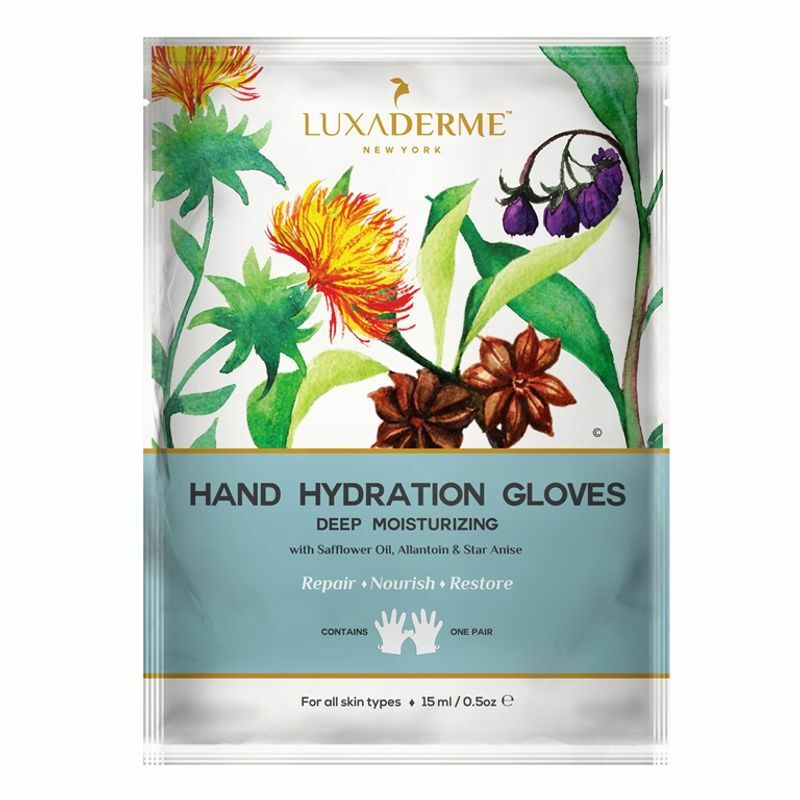 LuxaDerme Hand Hydration Gloves contain a nutrient and moisture rich essence ideal for when your hands need that extra care and attention. These moisturizing gloves when used regularly restore elasticity and lustre to our hands making them soft, supple and radiant. It also helps softens your cuticles and revitalize your nails. These disposable hand gloves feature dual layer technology, containing a rich blend of potent botanical extracts and antioxidants that helps provide intensive moisturizing and nourishment deep into your skin all in less than 30 minutes. It is easy to use, effective, non messy and non sticky. It is free from any chemical and synthetic ingredient that may prove harmful to your skin. It comes in durable foil packet and is travel friendly. Shea Butter: It is a good source of vitamins A and E, which strengthen your skin and help it repair damage. Tocopheryl acetate (Vitamin E): It is a natural skin-conditioning agent and antioxidant. It helps reduce the formation of free radicals from exposure to UV rays, promotes the healing process and strengthening the skin's barrier function. Safflower Seed Oil: This is a lubricant that acts as a protective moisture barrier on your skin. Rich in essential fatty linoleic acid increasing skin suppleness and giving it a smooth and bright texture. Allantoin: Protects and maintains moisture in the skin. Promotes cell regeneration in exposed skin. It has great anti ageing properties and helps soothe irritated skin. Witch Hazel: Soothes the skin and serves as anti- inflammatory agents and enliven the dull skin. Note:This mask does not contain any Paraben, Sulphates (SLS), Phthalates, Petrolatum, Heavy Metals, Alcohol, Artificial Colours or Fragrances.